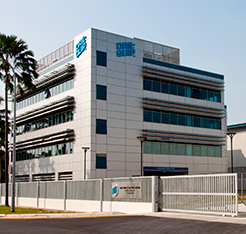 Dril-Quip Asia Pacific Pte Ltd. (DQAP) is located on an 11.2-acre site in the industrial area of Tuas in the island state of Singapore. Nine buildings are located on this acreage, with total shop and office space of approximately 217,500 square feet. Dril-Quip Asia Pacific serves over 50 customers in more than 20 countries, from Asia-Pacific to India and the Middle East. This facility gives Dril-Quip the ability to engineer and manufacture essentially all of the Company’s product line. The Administration Building, with 28,334 square feet of office space, houses the administrative, engineering, accounting, sales and information technology departments. There is an 8,000-square-foot cafeteria provided on-site for employees and visitors. The Finish Machine Shop includes 68,073 square feet of shop floor space and 17,239 square feet of office space. In the shop areas there are two bays that are referred to as the ‘light’ and ‘heavy’ bays. There are two overhead cranes in the light bay, each with a load capacity of 10 tonnes, and three overhead cranes in the heavy bay, one with a load capacity of 20 tonnes, and two cranes each with a load capacity of 10 tonnes. The Finish Machine Shop holds CNC horizontal lathes, vertical lathes, horizontal boring mills and horizontal machine centers, programmed in-house, that are capable of manufacturing the majority of Dril-Quip’s products. The Final Assembly Building is 9,481 square feet, including office space. 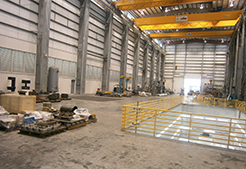 For handling equipment during assembly operations, a Crane capacity of 50 tons and hook height of 74 feet is available. Pressure equipment provides the capability of pressure testing equipment up to 22,500 psi. The Final Assembly facility is capable of handling and assembly of all Dril-Quip products. DQAP’s Fabrication Building consists of 18,420 square feet of shop floor space and 5,677 square feet of office space. One overhead crane provides 10-tonne load capacity. Here, welding operations are performed to fabricate wellhead components, mud mats, permanent guide bases, temporary guide bases, tree frames, riser joints and diverter housings. There is 13,734 square feet of shop space and 3,354 square feet of office space within the Pipe building. 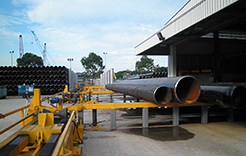 In the Pipe Shop, the tubular production process is designed to be continuous, incorporating a “hands-off” pneumatic handling system with designed-for-purpose sub-arc welding stations. The line has four welding stations that, when working simultaneously, have the potential to weld 60 joints of 20-inch diameter pipe per day. The weld line is designed to handle tubulars from 16 inches in diameter up to 36 inches in diameter and lengths ranging from 20 feet up to 45 feet. The Pipe Shop performs all types of NDE inspection, including gamma-ray, ultrasonic, liquid penetrant, and magnetic particle. 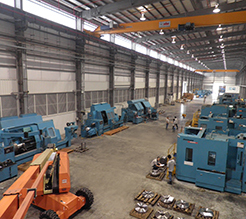 The Coating facility consists of 6,939 square feet of shop space and is equipped with a crane capacity of 10 tons with a hook height of 35 feet. The company applies several coatings to its products that protect the equipment from the harsh subsea and offshore environments that it is subjected to during operation.